When I heard about the possibility of 33 language groups in Nigeria and Burkina Faso being forced to stop their Bible translation efforts, my heart broke. This is tragic! That news was shocking enough, but when I heard why these translations are at risk . . . I was horrified. The violence in some of the regions where the translations are taking place is almost unbelievable. Neighbors are slaughtering neighbors. Schoolchildren are being kidnapped. This chaos has been going on for generations, and the nightmare doesn’t seem to have an end. Yet there is light shining in this darkness . . . In the face of hardships and persecution, local churches in these countries felt so compelled to have God’s Word in their heart languages that they secured the funding for Bible translation tools through their networks and started the work. They were on the verge of finally having God’s Word in their heart language, but they unexpectedly saw their funding cut. A massive disappointment—these translations are in jeopardy simply for lack of funds. These national Bible translators give their lives to this because they know that God’s Word brings peace. I am not speaking theoretically—I mean literally! In the heart of Nigeria—a land of intense tribal warfare, where people groups have refused to even speak to one another for years—Bible translation is the vehicle bringing about a miracle! Enemies are coming together, by the power of the Word—I’ve witnessed it. Even a local governor has committed himself personally to getting Scripture into his own heart language—Why? Because he finally found something that could break Satan’s hold on his people and heal his land. Just when it seemed that the kingdom of darkness was being driven out through the light of God’s Word, we have to fight harder. As I prayed about the languages groups in Nigeria and Burkina Faso at risk of stopping their Bible translations, I knew I had to reach out to our faithful supporters for help. As we approach the Easter season—and the celebration of the resurrection of our Lord and Savior Jesus Christ—I am asking each of you to join me in helping these national Bible translators. Together we can help give national translators an opportunity to share the story of the resurrection with their people—in their heart language! 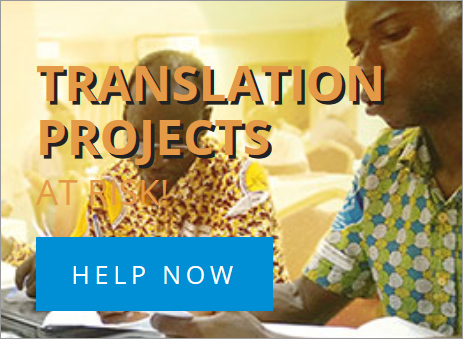 On average each translation workshop costs $19,500. The total need for all 33 languages in Nigeria and Burkina Faso is significant, but my heartfelt goal is to fund at least three of these language workshops this Easter. What better way to celebrate the Easter season? When you help fund these projects, you are speaking peace over a nation that has been torn apart by violence and hatred, haunted by intense poverty and brokenness, and yet on the verge of a great revival through the power of God’s Word! We can’t just turn our back on this plea—so together, let’s say “YES!” and help our brothers and sisters in Nigeria and Burkina Faso finish the work that God has called them to. What will happen in these countries because God’s Word is sent forth will be unbelievable . . . I believe it!